FANTASTIC 140 GRAM GREY WITH WHITE/BLUE SPLATTER VINYL. "Legacy of Kings" (1998) is the second album created by Swedish metal Gods HammerFall. Arguably, throughout their lifetime as a heavy metal outfit, their second album release ‘Legacy of Kings’ is the greatest thing to ever leave the Hammerfall studio; boasting some of the most powerful vocals, and shredding licks, that the band have ever produced. 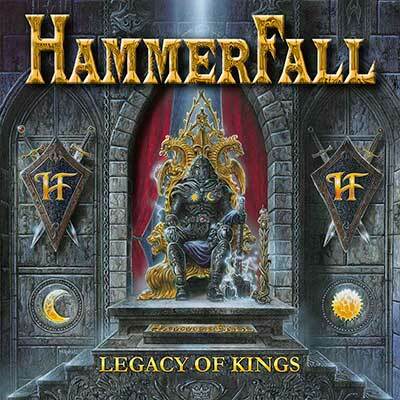 • Legacy of Kings" (1998) is the second album created by Swedish metal Gods HammerFall. • Arguably, throughout their lifetime as a heavy metal outfit, their second album release ‘Legacy of Kings’ is the greatest thing to ever leave the Hammerfall studio. • Boasting some of the most powerful vocals, and shredding licks, that the band have ever produced. • For fans of Manowar, Iron Fire, Iced Earth, and Edguy. • FANTASTIC 140 GRAM GREY WITH WHITE/BLUE SPLATTER VINYL.